JayWalk - All Your Xmms Are Belong To Me: Holy Calamari!! The news reported it and Kevin beat me to it on his blog. Yup, I was refering to the recent capture of the Colossal Squid off the waters of the Antarctica Ross' Sea. 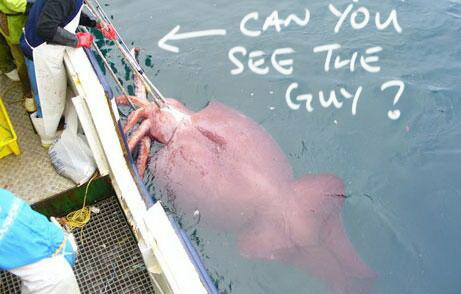 Due to the 2-dimensional nature of photographs, the picture did not do justice to the actual size of the squid, especially when there is a pair of gloves in the foreground, which gives the perception that the squid wasn't really that big. However, if you were to look closely at the photo, you would be able to spot a guy in the water, wearing a white shirt and red helmet. At 450kg and the size of a bus, that is one huge mother of a f*cking big sotong!! Click here to read the article over at National Geographic. Afternote: I just gotten hold of a bigger picture in clearer detail and as it turned out, there wasn't a guy in the water. The "white shirt" just happened to be the white underside of the tentacle. Come to think of it, given that the squid was still alive during capture, it wouldn't a good idea to be in the water at such close proximity to begin with. See below for the zoom in. * Photograph courtesy New Zealand Ministry of Fisheries. Yes, I should have photoshop it and show the contrast. I'll link my reader over. Too lazy to launch photoshop. 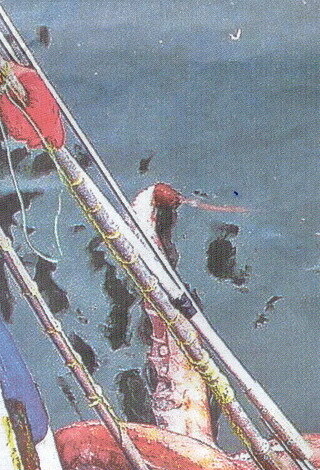 Kevin: I just managed to get hold of an enlarge photo showing the guy in the water in greater detail. Will scan and put it up later. the scientist say that if want to eat calamari.. it will be the side of a tractor tire.. lol..
Gary: We must approach this in the spirit of the Ch1nese people. We eat everything thing! There is an old saying: If the back faces the sun, it is edible.